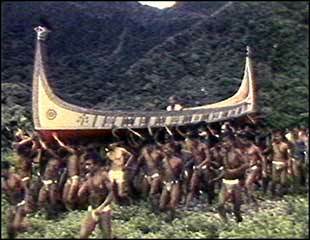 Rites of opening are celebrated in order to « shape the port » (meyvanoa) and call the flying fish of the first migrations.Even though the Yamis have been converted to Christianity, their ritual practices hinge on a vast category of entities : celestial divinities called « the Men From-Above » (Tao Do-To), « the wandering souls » (anito) which inhabit the Yami universe, and « the vital principles » (pahad) animating the human body as well as the plants (millet), the animals (flying fish) or the sacred objects (gold pectorals). The collective power is gathered within the hands of the elderly who own goods (taros, pigs, gold, etc…). They act as middlemen for those of their lineage, known as « those of one breath » during the ritual ceremonies, the sacrifices and the relations of exchange between the different groups. The exchanges do not imply only goods but also banquets, speeches and responsorial songs.The Yamis have gone back to their original ethnonym, Tao, following the ratification of the law on the identity of the Aborigenes (2001). Screening on Friday May 3rd, 2013 during the 10th European Association of Taiwan Studies (EATS) Conference at École Normale Supérieure, Lyon, France.